Today, I mark it as the start of my own 30-day challenge. My monthly subscription is hella expensive. For me, at least. It’s composed of one and a half weeks of allowance, blood, sweat and tears. 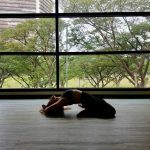 Last month, I joined the studio’s 30-day challenge and ended up attending only 8 days out of 30. That’s a bit disturbing for me not just because of the costs but in terms of fitness. I’ve always been active (and paranoid about my weight). However, with law school stress and lack of time (the usual excuses I guess), my weight justgoes up and down. Last year, I’ve been diagnosed with PCOS (Polycystic Ovarian Syndrome) and one of the effects is tadaaaa— difficulty losing weight. Haha. It’s crazy. Its one of the things that I get frustrated as well. Sometimes I think, I’ll just go to Belo and have a cosmetic surgery or something. But at the same time, I’d like to love my own body and be patient about results. It’ll come right? I’ll get the body I want right? Or maybe, I’ll love my body for what it is right?